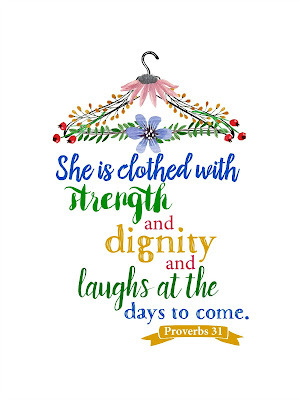 I just love everything that pertains to the Proverbs 31 woman! Who is this Proverbs 31 Woman? She is the most amazing woman ever! She is so full of entrepreneurship, loving kindness, loyalty and so much more! To learn more you should check out my older blog posts about her here. I will be updating those post soon and adding new ones as I go along. If you are like me, you will want to decorate everything you have with that theme. While looking for things for myself, I thought I would share what I had stumbled upon in my search at a beautiful blog On Sutton Place. I just love this! You can hang it in a frame for your wall, or if you are crafty you can print this onto sticker paper and customize a notebook! I will be sharing more of these free printable's and more about the Proverbs 31 Woman so check back soon, or you could subscribe by email!